PositronChicago.com: Otherworld's "The Rogue Aviator"
This weekend I saw the opening night of The Rogue Aviator, the newest production from Otherworld Theatre. 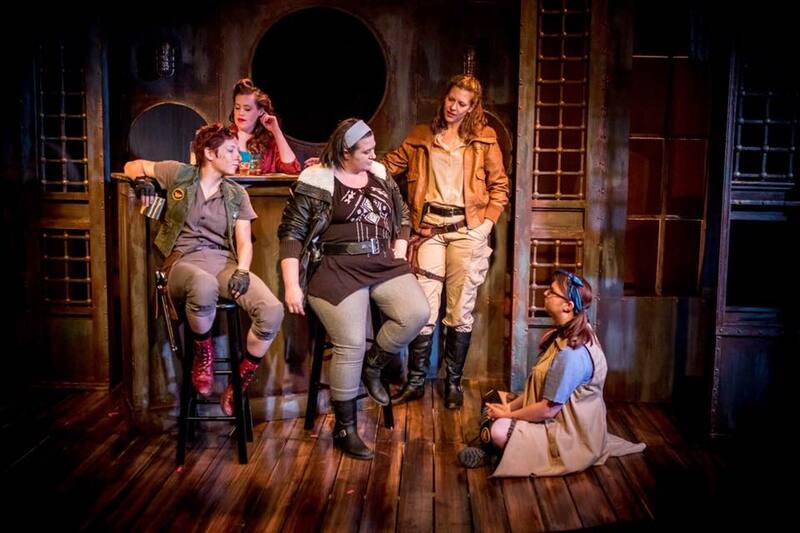 Written by Nick Izzo and directed by Tiffany Keane-Schaefer, the play brings a tale of dieselpunk aerial adventures to the stage. Set in an alt-history version of the 1920s, the story revolves around the flying city of Olympus, a supposed techno-utopia threatened by sky pirates and its own descent into an oppressive military tyranny. The eponymous Rogue Aviator is Ellie McCloud (Moira Begale), a nobly-motivated bounty hunter with ties on both side of the conflict. 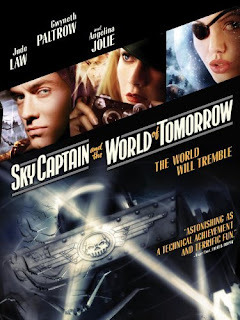 I'm a big fan of dieselpunk—a bit more serious and believable than steampunk, more blue-collar than raygun gothic or other retro-futuristic styles. It's hard to tell exactly what stories helped inspire The Rogue Aviator, but films like The Rocketeer (1991) and Sky Captain and the World of Tomorrow (2004) spring to mind, as do games like Crimson Skies (2000) and the Bioshock series (2007-13), particularly Infinite's flying city of Columbia. Communicating a world that is both fantastic and technologically rich is a challenge for the stage, particularly as dieselpunk is not the most well-known subgenre. 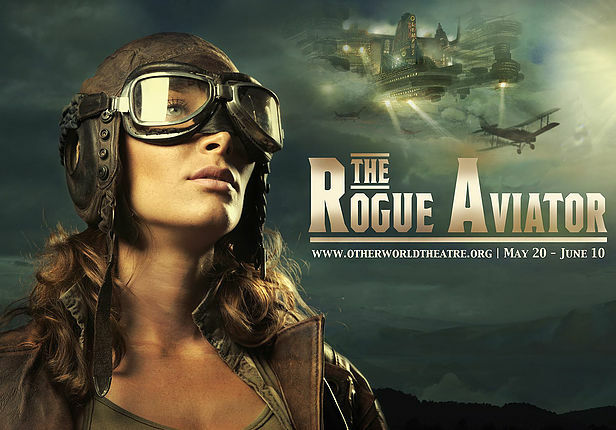 The Rogue Aviator uses a few different elements to convey the setting: an introductory television broadcast, 1920s musical cues, and humorously expository radio segments. The costuming is superb. The three factions have immediately recognizable visual styles: the flamboyant and leather-heavy pirates with lots of reds and burgundies; the angular, monochrome, and slightly totalitarian-feeling Olympian military; and the pragmatically flight-suited rogues in washed-out working browns. '20s finery touched with a bit of Western frontier garb round out the rest of the cast. I was equally impressed with the set: two "cockpit" constructions on opposite ends of the stage allow for dogfight scenes, as well as a few effective radio conversations. The central set is particularly well done, a versatile series of backings that, with the movement of a few set pieces, easily convey the sense of a variety of settings from offices and bars to the girdered interior of a flying fortress. I still felt a little out to sea on a few worldbuilding points, however. For all that Olympus is central to the story, it was not immediately apparent where in the world each scene took place—whether they were somewhere in Olympus, other flying venues, or, if on the ground, where, geographically, that is. A notable exception is the climactic battle, where lighting and sound cues make it clear we're on a different flying machine. The script also left me with a few questions about how all this works—a seemingly critical piece of government legislation about "Open Skies" is repeatedly referenced but not explained, and it's also not clear how "rogue" the rogues are or why: George Ellison's Senator Byron's seeming turn towards villainy at the end is hard to parse without knowing why the rogues are considered national traitors. The heart of the play is McCloud's changing relationships with each of the three factions. 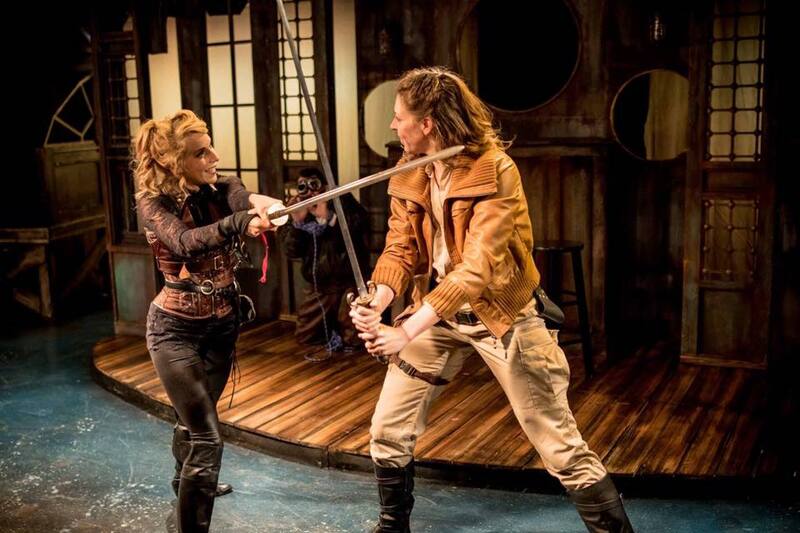 I was extremely impressed with the flashback sequences, with Molly Southgate portraying Young Ellie leaving a loving but oppressively gender-normative father—Duke McHale (R. Scott Purdy)—and seeking out Annabelle Swift (Sara Robinson) and her group of rogues. We also learn about McCloud's relationship with Cilino Falco (Mary-Kate Arnold)—a flashback that abruptly reframes Falco's villainy in the main timeline of the story. I kind of love that we never learn what happened to Falco's eye. These core dynamics are strong, but there is a great deal of other material interspersed throughout—many scenes showing inter-Olympian politics and the sky-pirates' consolidation of power, which may help structure the plot but, I thought, rather attenuate the more effective aspects of the show. The "found family" of McCloud's rogues work well, and Arnold's Falco exudes chemistry with everyone she shares the stage with, but many of the other relationships and storylines felt a bit leaden. Now while I do feel that the core plot is a bit diluted by all these other threads, it must be noted that the play is strengthened by some superb supporting roles. 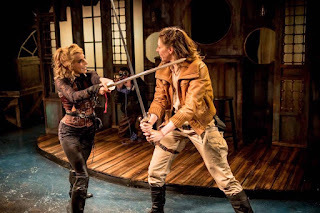 Emerson Ellias and Jacob Bates bring a great deal of vibrancy to their sky-pirates and aces, while rogues Mabel (Katy Jenkins) and Tilly (Chelsea David) put me in mind of Firefly's Kaylee Frye and some kind of B.A. Baracus-by-way-of-Alan-Arkin-in-The Rocketeer, if you can imagine such a thing. Mayor Willoughby, played by Nathan Pease, brought a very welcome dash of comedy with his every appearance. There's a lot going on just beneath the surface of this script. It's surprisingly subtle in its handling of gender issues—except for Young Ellie bucking against a world in which flying isn't "ladylike", there's no verbal commentary on sexism. And yet: the entirety of the Rogues we meet are women who pointedly reject social norms, while the entirety of Olympia's power structure is made of patriarchal men. It's not in your face about it, but the plot is essentially about rejecting the Sky-Father in favor of Sisterhood. Which is pretty interesting, especially compounded with Falco & McCloud's relationship and a conspicuous absence of a central hetero romance. 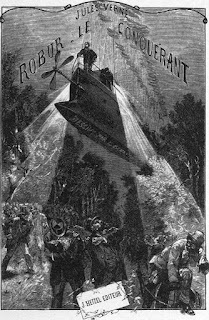 Perhaps the first sky-pirate, Robur. The Rogue Aviator is a bit more forward with its political criticism. 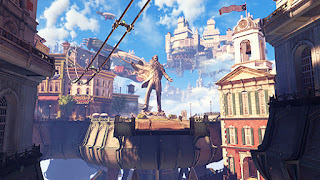 Like Bioshock's cities of Rapture & Columbia, Olympia is a kind of satire, a pseudo-utopia, criticizing the inevitable underbelly of the kind of heroic libertarian project seen in Ayn Rand's Atlas Shrugged (1957)—and, in Falco's speech about her father's exploitation by Olympia, explicitly tying that to the euphemistic slavery of sweatshops and company towns (one of the more famous of which, the Pullman Company town, was right here in Chicago), as well as the myth of upward mobility. 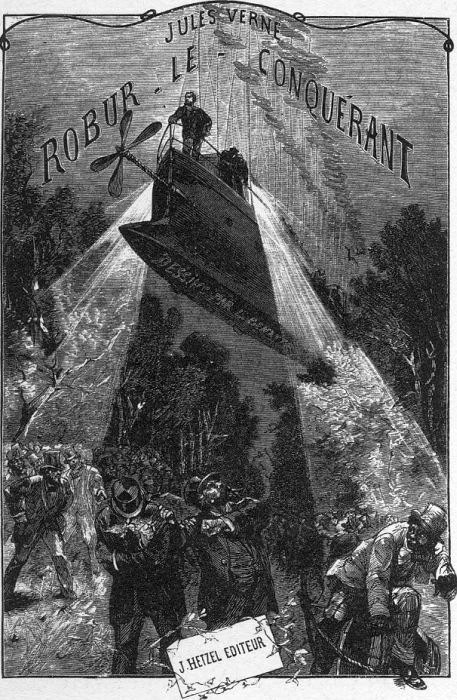 Falco's eventual terrorism as a product of the excesses of capitalism is an interesting turn, and invites comparison's to Verne's antiheroes, Captain Nemo and Robur the Conquerer (1886). I thought the ending has some intriguing ambivalence: the only active voice for change killed by a (granted, self-exiled) member of Olympia's privileged elite, the independent Rogues absorbed and re-outfitted into the establishment Aces, and a promise of "a better city" kept vague and off-stage. That's a subversive reading—McCloud is clearly on the side of good, and there's a possibly-contemporary message about "changing the system from the inside" instead of catastrophically from without, but I like that I felt just a tiny bit uneasy about the ending. A really fun show! I'm looking forward to seeing it again, especially because I think a few of the loose points I mentioned might tighten up in subsequent runs. I highly recommend it, and am hoping I can round up some book club folks to go with next time. One note of caution I should mention if you're planning on attending: the show puts the front row in very close proximity to the combat sequences, and there's liberal use of stage firearms, which might be alarming if you're not prepared. 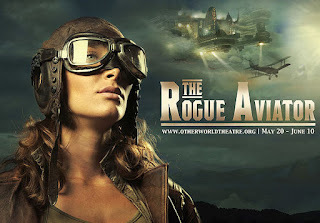 The Rogue Aviator is running through June 10th at the New Strawdog Theatre in Ravenswood; tickets are pay-what-you-can with a suggested price of $20 (which is pretty cool). You can find tickets and more info at Otherworld's site, and keep up with the company on Facebook, Twitter, and Instagram.